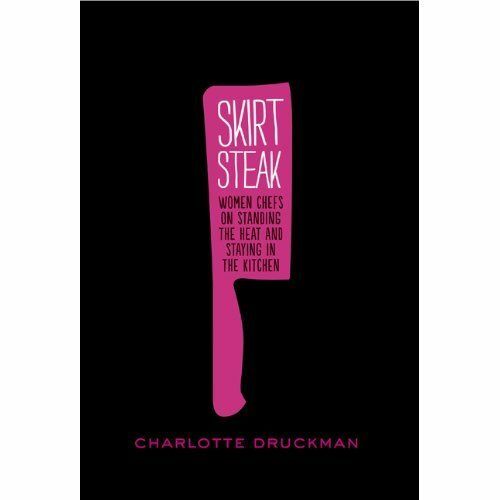 Today: We chat with our beloved Piglet co-founder Charlotte Druckman about her fantastic new book on women in the restaurant world, Skirt Steak: Women Chefs on Standing the Heat and Staying in the Kitchen. Charlotte Druckman is a busy woman. You can find her writing in the pages of publications like The Wall Street Journal, Bon Appetit, Food & Wine, and more; she is the co-founder of our very own Tournament of Cookbooks; and to top it all off, she just published her first book, Skirt Steak: Women Chefs on Standing the Heat and Staying in the Kitchen. Jumping off from and expanding on an article about women in the restaurant world that she wrote for Gastronomica, Skirt Steak is the product of 73 interviews with women chefs across the country. We spoke to Charlotte about her love for milk and cookies, how the restaurant world is changing, and East coast-versus-West coast dining. Read our interview below, and check the schedule of her Skirt Steak Supper Series to see if Charlotte is coming to a city near you! 1. Describe your all-time favorite meal. My all-time favorite meal? That's hard. I'd like to think I haven't had it yet -- something to look forward to. But, if I have to pick a fallback, I'm going with something potentially controversial: milk & cookies. That's right. I think it counts as a meal. I grew up with a mother who, from time to time, when my father was away, had dessert for dinner, so there's a precedent here. I love baked goods. I used to love milk. Now, I'd probably have a matcha latte, a cup of Blue Bottle coffee, hot chocolate, or rooibos tea, but the general structure holds -- you've got cookies and something with which to wash them down. What kind of cookies? A medley is best. And the mix depends on my mood -- is it a chocolate kind of day or not? • Either way, I think I'd want one of Dorie Greenspan's (if there's no recipe available, I'd pick them up from one of her two new Beurre & Sel outposts; do note, you can find a recipe for her standard sable, based on that of Pierre Herme, in this cookbook). • I also love the Magic Bars at, appropriately, Milk & Cookies on Barrow Street. They published a cookbook last year, so you can find a recipe for those too, but, I've also realized that these are the very same bars you'll find on the back of a condensed sweetened milk can. • City Bakery's molten chocolate chip cookie and its classic chocolate chipper are both near-perfect, and Maury Ruben refuses to share the secret formulae behind them. So, I'd walk over to East 18th Street to get them -- and I'd pick up an oatmeal raisin and, if it's in season, a coconut cookie too. Why not? • Meanwhile, another stellar chocolate chip cookie is Kim Boyce's whole wheat example, which you can find a recipe for in her standout, Piglet-worthy Good to the Grain. • Lately, I've become quite a fan of Black Jet Bakery in San Francisco. The Crackaroons Gillian Sara Shaw makes are shockingly delicious (because, let's face it: most coconut macaroons are no better than mealy lumps of sawdust). It's the salty caramel that does the trick there. • And how could I forget Levain Bakery's oatmeal raisin sensation (it's more than a cookie), that oversized grenade full of what tastes like barely-baked, buttery, oat-studded cookie dough? Their chocolate chocolate chip cookies are just as grand (double entendre) -- dark and rich. • And one more for the pile, Christina Tosi's blueberry-n-cream, which you can find at a Momofuku Milk Bar near you, or in that pastry chef's cookbook, another T.O.C. contender. 2. How did you decide to write a book about women in the restaurant world? I'm certainly not the first person to write about women chefs. What made me want to tackle the subject was that I was tired of seeing the same conversation played out. It always seemed to be about the dearth of women in restaurant kitchens and, related, the issue of those who were in those galleys leaving. It took a more negative, or defensive position and presumed that female chefs were an anomaly. There also seemed to be a lot of talk about whether or not, or how men and women cook differently because of their genders, which I've always thought was a red herring, since no two people cook alike, and, really, who cares if we cook one way and men cook another? To say that we can't be restaurant chefs because we cook differently is inane and also presupposes that there is only one way to be a restaurant chef or to cook in a restaurant. I wanted to celebrate those women chefs who have succeeded in the restaurant world, and, simultaneously, distinguish them from professional home cooks, since people are all too quick to equate or confuse the two. And, I wanted to talk to lots of inspiring, talented people in the field that, as a writer, most interests me. 3. What was it like to interview all these women? What were some of their similarities and differences? It was a whirlwind of awesomeness is what, because I didn't have a lot of time, and within that short period of a few months, I interviewed 73 of them. They all stood out and made a strong, positive impression. I was amazed by how much they had to say and how generous they were with their time and thoughts. Similarities tended to be more geographically determined. In California, being a woman chef is no big deal because there are so many of them out there, and most, refreshingly, are chef-owners. The women in the Bay Area, especially, were the least phased by sexism and also seemed less beholden to the French paradigm in general (in terms of the brigade structure, and the culture of fine dining). But you also saw a general New York bias -- it's the most competitive place to work because the stakes are that much higher. Succeeding in New York tends to put you on the map or give you a certain credibility in terms of access to media and awards...and to funding, which is another common theme. Women, and I'd include myself in this generalization because I don't think it applies solely to chefs, have a harder time asking for and securing funding. It's something we need to think about, collectively, going forward, which brings me to the next question. If I had a magic wand, I'd be retired, in Provence, living off of palmiers, figs, and rose. Sexism isn't so easily fixed, sadly, in any area. We need, all of us, to think about the criteria we base our qualitative judgments on in terms of rating restaurants and talent. If we're still judging everyone against a single anachronistic, irrelevant standard, we're not going to get anywhere. We need to acknowledge that there is no one definition of chef, or formula for a "great" restaurant. We can also look to programs like the Edible Schoolyard which put kids into the garden and kitchen at an early age and assign everyone the same tasks -- so you have boys and girls planting, picking, chopping, and cooking side by side. Women need to support each other, that's crucial. We need to be better mentors and, yes, we need to talk about and spread the money. Most importantly, we need to find new ways, continually, to discuss and expose what's happening in the professional culinary industry, whether it's about gender, health, ethics, economics, politics, or culture. I'm still in search of the perfect palmier. Otherwise, I'm in the midst of the Skirt Steak Supper Series. In eleven cities across the country, I've organized collaborative dinners at the restaurants of chefs (most of whom are in the book). The hosting chef picks a non-profit to support and, in most cases, cooks alongside other chefs (again, many of these are in the book, but not all of them) to celebrate Skirt Steak, and, more importantly, raise money for a good cause. I've just finished up on the West Coast where we had a dinner in Seattle, Portland, San Francisco, and Los Angeles. They were all magical (no wand could have created anything better). I wanted to take the community I tried to create on the page and bring it into the real world. So far, I think we've accomplished that. Coming up, there are dinners in New York, D.C., Philly, Chicago, Atlanta, Charleston, and Boston (here's the schedule). Then there's the day-to-day stuff; you can find me scribbling away for the "Off Duty" weekend section of The Wall Street Journal, and I've recently started a weekly Pastry of the Week column for the Bon Appetit blog. I've got a few future projects in mind -- a book or two, perhaps. And, of course, there's the Tournament of Cookbooks. Amanda, Merrill, and I have chosen this year's 16 nominees and are excited to see which will win the coveted Piglet trophy. LOVE this book. Congrats, Charlotte! Charlotte has exquisite taste. I second Black Jet Bakery. DYING to visit Buerre & Sel.